BOSTON, MA -- The Eastern Hockey League Premier (EHLP) is pleased to announce that Dave Tremblay has been named the 2018 Most Valuable Player (MVP). Tremblay began the season with the Central Penn Panthers and racked up 64 points in 31 games. The 2000-born forward and his linemate, William Smith, were then traded to the Philadelphia Jr. Flyers for the playoff stretch. Since joining Philadelphia, Tremblay has 24 points in 19 total games. The Most Valuable Player award and all other league honors, are voted on by the coaches in the EHLP. "Having seen Dave play a few times, he is truly one of the most-skilled young players we have in the league," said Mark Kumpel, the EHL's Director of Hockey Operations. "Being a 2000-born forward, the future is very bright for Dave. Congratulations to him on winning this award." Breaking down the season as a whole, Tremblay leads all scorers in the EHLP with 88 points in 50 total games. In those 50 games, the Canadian scorer has only been held off the scoresheet 10 times. 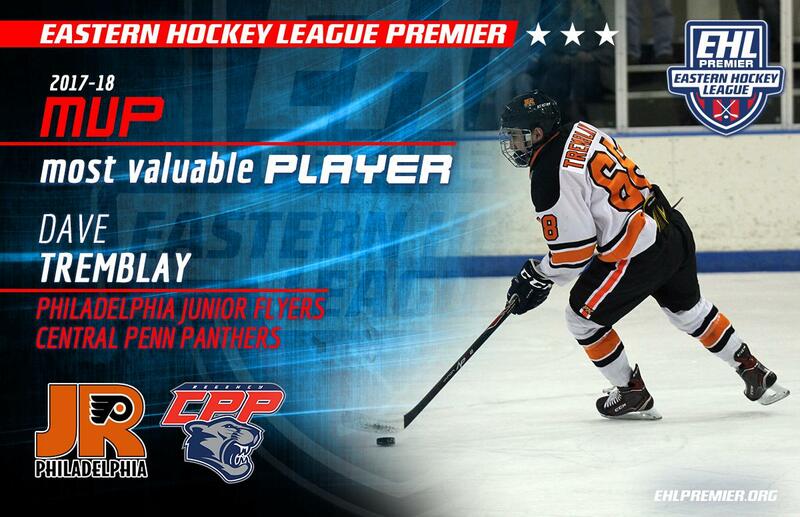 Tremblay has truly embodied the meaning behind being the Most 'Valuable' Player, as he had a role in over 70% of the Panthers goals during his time with Central Penn. Tremblay truly is an all-around forward with 49 goals, 39 assists, 24 power-play points, and 5 game-winners this year. His season is also not over yet, as Tremblay and Jr. Flyers are heading to Providence this Sunday. Schneider Arena is the site for the EHLP Championship Game where Philadelphia will take on the Boston Jr. Rangers. 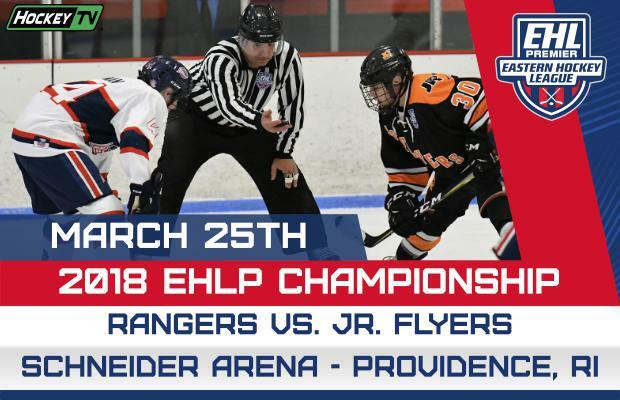 You can watch the EHLP Championship Game LIVE at EHL.HockeyTV.com, or if you're planning on coming to Providence, the admission is FREE on Sunday. The 2nd place finisher for the MVP honor is Danila Larionovs (Boston Jr. Rangers) and 3rd place is Geordan Buffoline (Vermont Lumberjacks).